"Five Creeks and Falls ... Shellrock Mountain to Starvation Creek, Oregon"
Click image to enlarge Lancaster Falls, Oregon, as seen from Interstate 84. Lancaster Falls is 303 feet tall and located on Wonder Creek. Image taken June 15, 2012. On the Oregon side of the Columbia River, between Shellrock Mountain (RM 158) and Starvation Creek (RM 159.5), lie five small creeks and falls. Upstream to downstream are Cabin Creek and Cabin Falls, Warren Creek and Hole-In-The-Wall Falls, Wonder Creek and Lancaster Falls, Lindsey Creek and Lindsey Creek Falls, and Summit Creek and Summit Creek Falls". On October 30, 1805, Captain Clark wrote about four cascades on the Oregon side while above Shellrock Mountain and Wind Mountain. The possiblities for those four falls are - upstream to downstream in a two-mile stretch - Starvation Creek and Falls, the seasonal Cabin Creek and Falls, Warren Creek and Falls, Wonder Creek and Lancaster Falls, Lindsey Creek and Falls, and Summit Creek and Falls. Cabin Creek and Cabin Creek Falls is the small stream drainage located approximately 1/3 mile west of Starvation Creek and Falls. Cabin Creek Falls is a 220-feet-high two-tier falls, with the tallest drop being 130 feet. 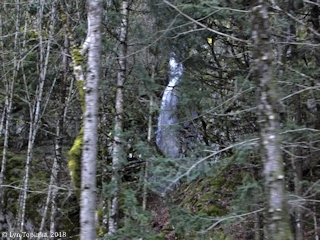 Cabin Creek Falls can be seen through the trees from Interstate 84. "Cabin Creek Falls is the first fall encountered along the Mt. Defiance trail. The falls drop from a razor thin crack in the adjacent cliff, bouncing once on a small shelf, then dropping to the trail. The falls are situated no more than 50 feet from the trail ... When the surrounding trees are bare, once can see almost the entire falls from the trail, the upper tier more or less alone, and the lower tier by itself, but thanks to [a] dastardly boulder, never together. ... The falls can also be seen well from Interstate 84, though, again, not in its entirety." Click image to enlarge Cabin Creek Falls, Oregon, as seen from Interstate 84. Image taken February 12, 2018. According to the Columbia River Basin Fish and Wildlife Program's website (2014), there are nineteen small rivers and creeks entering the Columbia River between the Bonneville Dam and Hood River, including the 2.5-mile-long Warren Creek. Warren Creek is intermittent at its mouth with a 50-foot-high falls at Mile 0.2. Warren Creek heads in Warren Lake and its mouth is an impounded pond created by railroad fill. Both Warren Creek and the early Warren Falls were named after Warren Cooper, a former U.S. Forest Service ranger. "If a road is washed out by a stream, the road is usually repaired because it's the most practical thing to do. Well, apparently in the early 20th century, practicality was not of great concern. The original Columbia River Highway was constructed paralleling close to Warren Creek's major waterfall, Warren Falls. During high water, the creek would often wash out the road, so, rather than repairing or just moving the road, in 1938 someone decided to move the waterfall. A tunnel was blasted through the adjacent cliff, through which the creek was diverted, and Hole-in-the-Wall Falls was born." 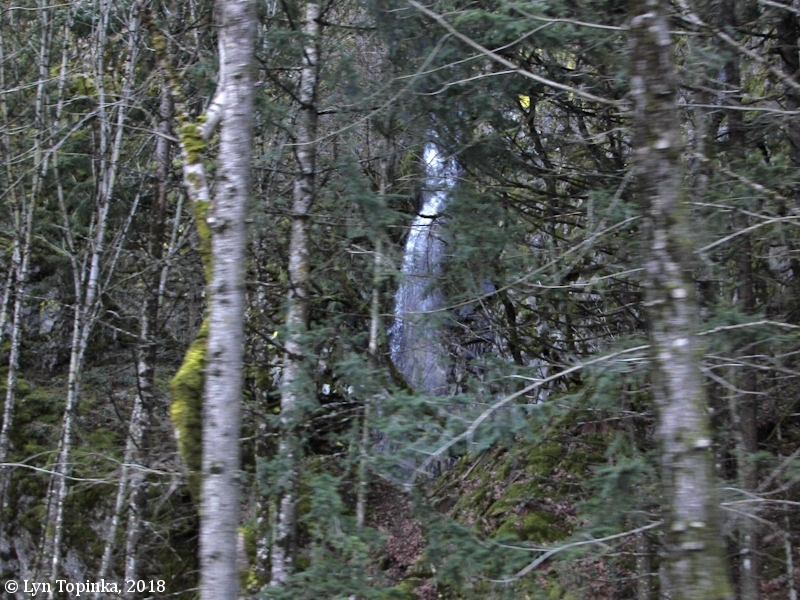 According to the Columbia River Basin Fish and Wildlife Program's website (2014), Wonder Creek is a 1/2-mile-long steep tributary to Warren Creek, with a falls at its mouth. Lancaster Falls is a 303-foot two-drop waterfall on Wonder Creek, located at Columbia River Mile (RM) 159. 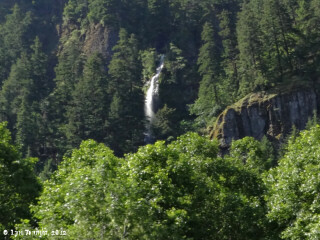 The upper portion of the falls can be seen from Oregon's Interstate 84 heading east, just before reaching the Starvation Creek Rest Stop. "Wonder Creek heads in a spring high up the mountain, sending a small but extremely consistent volume of water plunging 231 feet over a mossy cliff, then channeling into a narrow slot and fluming down about 50 feet before plunging the final 20 feet." In 1970, at the suggestion of Gertrude G. Jensen and Donald J. Sterling, Jr., Lancaster Falls was named after Samuel C. Lancaster, the engineer who designed the Historic Columbia River Highway. The U.S. Board of Geographic Names made it official in 1971. Click image to enlarge Lancaster Falls, Oregon, as seen from Interstate 84. Lancaster Falls is 303 feet tall and located on Wonder Creek. Image taken February 12, 2018. Lindsey Creek was named for John Lindsey, an early homesteader. The creek heads at North Lake and flows northeast into the Columbia River at Lindsey Pond, 2.5 miles north of Mount Defiance. The mouth is located at Columbia River Mile (RM) 159. Lindsey Creek Falls is 50 feet high with two drops, the longest being 40 feet. The falls is located at the 396-foot elevation. Harrison Falls, also known as "Lower Lindsey Creek Falls", is a lower falls along Lindsey Creek. This falls drops 64 feet in four tiers. Harrison Falls is located about 450 feet upstream from where Interstate 84 crosses Lindsey Creek. Lindsey Pond is separated from the Columbia by a levee for the Union Pacific Railroad tracks. Summit Creek circles the east side of Shellrock Mountain, and sports two falls. The upper falls bears the unofficial name of "Summit Creek Falls" and the lower falls has a historical name of "Camp Benson Falls" (also known as "Lower Summit Creek Falls"). "This is the upper of two known waterfalls on Summit Creek ... [Summit Creek Falls] consist of a flume like plunge of about 10 feet that falls into a pile of logs in a narrow section of the canyon, folllowed by another 5 foot drop before the creek veils a final 15 feet in an attractive fan-shape." "[There is] a second, lower, waterfall [on Summit Creek] ... This is clearly the major waterfall of Summit Creek, at least in the lower section, and mthe much more logical one to bear any historical name. 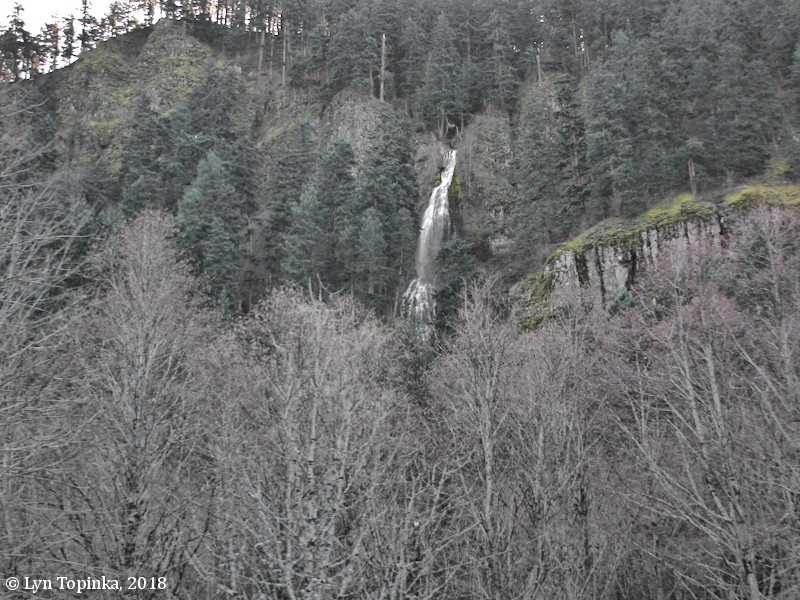 The falls occur where the creek breaks about 90 feet through a cliff band surrounded by several large deciduous trees, before cascading steeply for another hundred feet or so before gurgling into a talus field and disappearing entirely shortly before reaching Interstate 84. The falls can be partially seen from I-84 in the winter ..."